trace elements (Co, Fe, Ni…). In the particularly complex medium that includes most wastewater, trace elements, vitamins and hormones are usually present in concentrations that are sufficient for satisfactory water treatment. The same applies to K, S and Mg. On the other hand, the water to be treated might not contain sufficient phosphorus or even nitrogen. This is typical of some IWW (even when combined with UWW ); phosphorus and nitrogen then have to be added. On the other hand, the fight against eutrophication may require these elements to be eliminated (see suspended growth (activated sludge) processpage 3). Figure 4 shows the change in BOD measured from the oxygen consumed by a bacterial culture. In order to be complete, this change requires approximately three weeks at 20°C. We then obtain ultimate BOD or BOD21. (please refer to the formulary, section characteristics solution constants for additional examples). ratio increases noticeably and will do so increasingly when purification is more intensive. 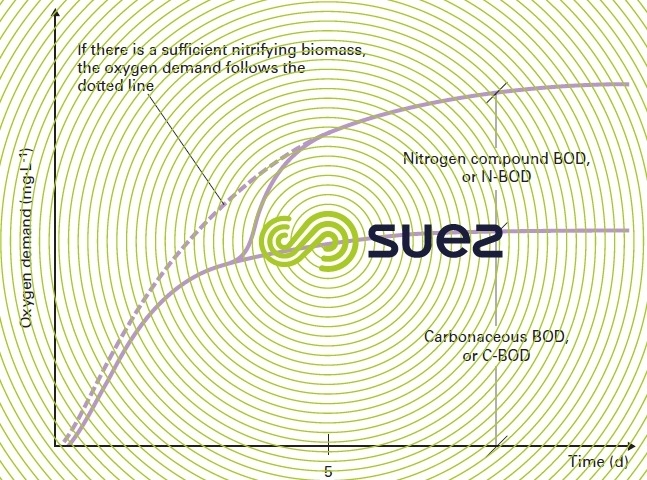 Figure 4 also shows the error that is committed if we confuse the oxygen that is actually consumed to eliminate carbonaceous pollution with the oxygen consumed by the nitrification of the effluent’s organic or ammonia nitrogen. 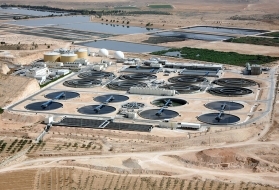 In "fresh" wastewater, nitrogen is mainly found in proteins and urea but, during the wastewater’s passage through the sewers, a significant proportion of the organic nitrogen is hydrolysed to form ammonia. As it enters the plant, nitrogen will typically be found as ammonia (60 to 75%) and organic nitrogen (25 to 40%) in a soluble and particulate form. The sources of nitrogen that are likely to be used by the various micro-organisms (see the nitrogen cycle) include practically all sources of organic and mineral nitrogen. Nitrogen is metabolised to provide mainly proteins, nucleic acids and cell wall polymers. It is understood that nitrogen constitutes approximately 12.4% of the dry weight of a pure biomass. In wastewater treatment, this figure is usually less than 10%, typically between 5 and 10%. Phosphorus is present in wastewater either as orthophosphates or as polyphosphates or organic phosphorus. Excluding biological phosphorus removal, phosphorus represents 1.5 to 2.5% of the biomass’s dry weight. However, it should be noted that this percentage will rise as the growth rate rises and that it varies in inverse proportion to temperature.